The law has never liked gambling, seen as the petri dish for crime that it is. "Gaming houses are considered as nuisances in the eye of the law.... being in its consequences most mischievous to society." In Chicago, a young couple committed suicide together after the wife racked up a $200,000 gambling debt. In Windsor, 76-year old John Hallet hung himself after losing $134,000 at the Casino Windsor. Solomon Bell, a 38-year old policeman shot himself after losing $3,500 at blackjack. 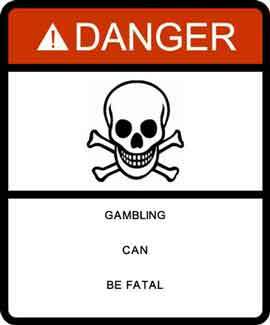 "... approximately one in five pathological gamblers attempts suicide. ... (T)he suicide rate among pathological gamblers is higher than for any other addictive disorder. "A survey of nearly 400 Gamblers Anonymous members revealed that two-thirds had contemplated suicide, 47% had a definite plan to kill themselves, and 77% stated that they have wanted to die." Las Vegas has the highest suicide rate of any city in the United States, some 500 annually. But even official numbers may not tell the whole story as a suicide is only listed as gambling-related if there is proof, like a note left behind or a casino card found in the pockets of the dead. Not all gamblers leave neat, explanatory suicide notes behind. Even if they had the wherewithal to do so, shame and guilt often motivates the suicidal to take their gambling struggle to their grave. Rare, in the annals of the law, is to found such a sickening marriage of law and traditionally criminal behaviour. Since 1900, gambling has been legal in Canada, albeit mostly state-administered. Gambling is very lucrative to the government and reduces the tax load of those who don't play; it is often called a voluntary tax. Casino and other gambling-related suicides are the price of doing business; a social cost to reap the financial rewards. In a Globe and Mail story on October 3, 2009, reporter Lisa Priest weaves the tale of Paul Isaacs, who lost a half-million dollars and then, rather than hurt himself, hired Yachetti, Lanza & Restivo of Hamilton to file a claim against the local casino. The statement of defence asserts that gambling is simply a form of entertainment where the price of attendance is at the patron's discretion! Gambling brings in millions of voluntary taxes for the government, but at what cost? Suicides rob the survivors of their loved one, often a person who supported others. Then, not only is the person gone but the assets too, leaving many an estate insolvent. There are urban legends of casinos shopping for blood-resistance carpeting and discreet suicide cleanup swat squads which seek to clean up the mess as soon as possible and to make sure the other patrons are not even aware of it. You won't find a casino employee quoted in the media on the topic of casino or gambling suicide. Casino suicide is considered a corporate secret, so secret that even in a jurisdiction with a public gambling agency, getting suicide stats require a court battle. Take Bill Clennet, who had to go all the way to the Québec Court of Appeal to get Loto-Québec to deliver internal suicide statistics. "0 pages were found containing the word suicide." In the early 1990s, Raymond Viger was a suicide distress line worker in Montreal. He asked to meet with Montreal Casino officers to discuss the alarming number of calls the suicide line was receiving from persons inside the Casino. The Casino firmly told him to get lost and asserted that they knew of no gambler with suicidal thoughts. Others claim that casino employees do know the on-the-edge gamblers. But the distressed are not singled out and spoken to. In bars, waiters will refuse to serve alcohol to a patron who has over-consumed. Not so in the Casino; any suggestion by a dealer to a player that they stop playing would likely get the dealer dismissed. Yet at the same time, when a dealer finds out that one of his former players committed suicide, the burden of guilt can be tremendous. According to company literature, since 1985, BCLC has raised $10-billion for the government of BC. British Columbia is one of the few provincial jurisdictions that, apparently, does not collect gambling or casino suicide statistics. However, as BC has 8% of the Canadian population, about 16 gambling-related suicides probably occur in BC each year. For every $26-million received from gambling in the province, there is one death by suicide. That is the stark reality of legalized gambling. Obviously, this cost of doing business is acceptable to the government. Government's primary job is to make sound and wise laws and to enforce those laws. The lottery agencies of those governments like to post, as a marketing tactic, a parking sign with the words "For Winners Only". To be honest, they should mark another spot "For Hearses Only".